first time in this e-radio family..
whitsundays are listening as well!! Hi Man.. listening you from Sardinia island..
Sheeeeeeeeeeeeet! Playa play on! i need this on my pod for late night drives. keep it playin! Woo! Blaq Poet and NORE killed! Very elegant mixing. Peace from Denmark. Yo! keep those grooves a'comin! Big up all the way from amsterdam! 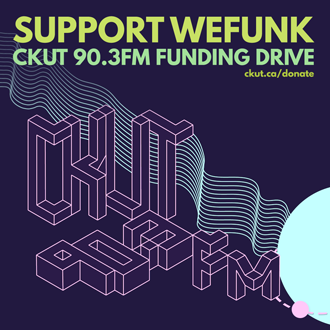 Just donated - the jams you guys provide are worth every penny! Thanks for all the hours of goodness! Also u should come to Estonia! parliament this sunday in Toronto be there or be L7.......!!! well the quality of this show certaily convinced me to send few bucks.. well done! Funding drive 2012 part 1: We entice you to donate to our parent station CKUT with lots of raw funk from Alvin Cash and Hebrew Rogers, soulful grooves by Freddie Scott and Leon Ware, ruff-n-rugged beats from Stones Throw's Willie Evans Jr., plus a visit from our favorite funkologist Duke Eatmon. DJs & GUESTS Professor Groove, DJ Static, Duke Eatmon, Sara / RECORDED October 26, 2012 / HOSTING PJ, Mike, Oliver & daduke. You can help too!